SCDCL (Solapur City Development Corporation Ltd), Solapur published a new job notification for Company Secretary Post. The recruitment is for total 01 Vacancy. The willing candidates are informed to see the latest notification March 2019. Qualification required Graduate in Commerce from any recognized University and More. Last Date of offline application is 30-03-2019. For More details of SCDCL Recruitment 2019 Read Below. Education Qualification: Graduate in Commerce from any recognized University and More. For Post wise Education Details follow the detailed advertisement. 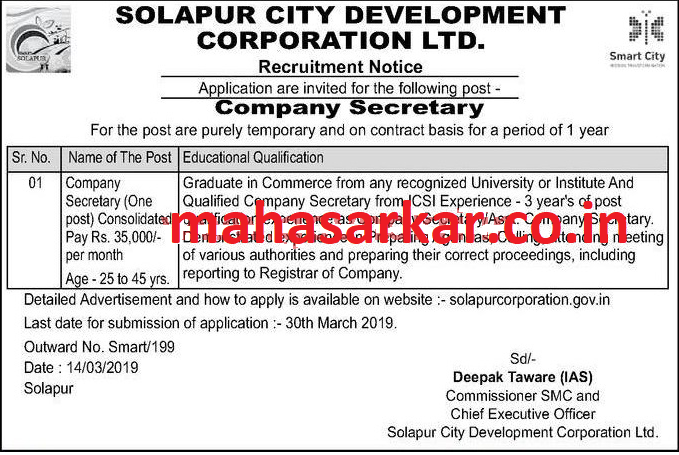 Interested & Eligible candidates can send their application along with all the necessary documents and testimonials to Solapur City Development Corporation Ltd. Application starts offline 16-03-2019. Last Date of application is 30-03-2019.